HouseLogic did a photo slideshow recently on the home projects that will add the most value to your home. not surprisingly, most of these projects involve your home's exterior siding, windows and entryways. Famous for its durability and reasonable price, lightweight vinyl siding also is easy to install, which cuts labor costs. Manufacturers keep coming up with new colors that won’t fade, so there are more choices than ever. Good-quality vinyl siding will last 30 years or more. Fiber-cement siding is a popular choice for replacement siding. Although its initial price is higher than many other types of siding (it’s heavy and labor-intensive to install), the durability and stability of fiber-cement means less maintenance in the long run. It takes paint well, so you can have your choice of exterior paint colors. It’s also fireproof and rot-resistant. Replacing an older entry door with a new steel model is the most cost-effective project in the 2013 Cost vs. Value Report. A steel door costs less than half of a similar fiberglass door. The steel outer layer is susceptible to denting; a brass kickplate (shown) helps protect the door from accidental dings. A deck is a cost-effective way to increase your living space and is a great way to enjoy the outdoors when the weather is nice. A simple deck using pressure-treated lumber is a good DIY project and saves up to 50% of a professionally built deck. Clean and seal your deck annually to keep it in great shape. 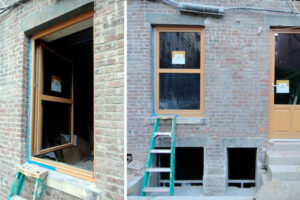 Swapping out older, leaky windows for new wood replacement windows is a style upgrade that saves energy. The Efficient Windows Collaborative says you’ll save up to $450 per year if you switch out single-pane windows for new double-pane windows in a 2,150-sq.-ft. house. Not in the market for new? Inexpensive weather stripping will keep out the drafts. Want to add more value to your home? Exterior Specialties of PA is here to help with all of your exterior siding, window replacement, and deck repair needs. Call us today at (215) 453-9180 for your FREE estimate. Call us for more information or a free quote. If you're looking for excellent service and a people-friendly approach, then you've come to the right place. At ESP Exterior Specialties of PA, Inc., our ultimate goal is to serve you and make your experience a pleasant one, and our team will stop at nothing to ensure that you come away more than satisfied. We are fully licensed & insured. We offer free estimates, use premium materials, and provide complete clean up. We offer 24/7 emergency patching and have over 42 years of combined experience.